The Island of Madagascar is the new Tourist Frontier waiting to be explored. A Madagascar Adventure vacation offers everything you have ever wanted. A vacation with a difference and offering more than you ever expected. Home to a diverse variety of unique wildlife, exotic plants, unusual Tsingy rock formations, and a strange & mystical culture, most of which can be found nowhere else in the world. A Madagascar vacation lends itself to more than just a beach holiday. As the world's fourth biggest island there is much to explore and be seen on this Mystical Island of Madagascar. To appreciate the full diversity of the Madagascar wildlife, culture, amazing plant life and unusual Tsingy rock formations you need to travel through the forests, through villages and across the countryside, finally enjoying 3 days of relaxation on the beaches of Nosy Be Island. 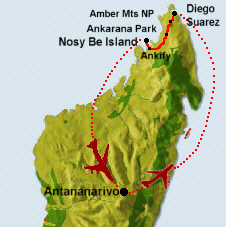 This adventure holiday tour takes us to the northernmost tip of Madagascar, Diego Suarez & then south west to Nosy Be Island. Diego is situated on the shores of the second largest natural bay in the world and a strategic safe deep water harbour to shipping with dry docks and other shipping services. Due to its logistical value it saw conflict in both the World Wars as can be witnessed from the artillery gun emplacements at the entrance to the bay, still visible today. 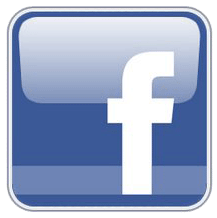 and will vary according to airline flights and accommodation availability. Flight from Johannesburg to Antananarivo, meet and greet on arrival and transfer to Relais des Plateaux. Afternoon at leisure. 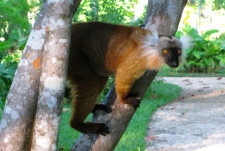 - or the Lemur Park just south of Tana. After an early morning breakfast transfer to the airport to board your flight to Diego Suarez. On arrival in Diego Suarez you enjoy a guided tour of Montagna des Francais and the incredible Three Bays – vast, mostly deserted, palmed-lined bays, lapped by the Indian Ocean. We pass Sugarloaf island in the bay before checking in at the Allamanda Hotel in the afternoon. Today you travel south to the Ankarana Nature Reserve stopping en route to view the unusual and distinctive limestone pinnacle formations known as the Red Tsingy. The Red Tsingy is a geologic oddity sculpted by time and erosion into a completely unique work of nature and unlike other better-known limestone Tsingy. Afterwards you head to Ankarana Lodge for check in. Today the guide takes you out into the forest exploring the Ankarana East Reserve rich in endemic fauna and flora, lemurs and birds. Visiting some of the caves you will see stalagmites, stalactites, immense rooms, underground rivers, and fantastic fauna and flora. 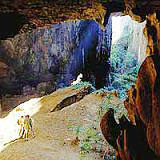 You also get the opportunity to see the Grey Tsingy in Ankarana as you further explore this mystical land. After Breakfast continue on from Ankarana past plantations of vanilla, coffee & cacao to the village of Anikify, opposite Nosy Be Island. You are transferred to the speed boat for the 30 minute crossing to the port of Nosy Be, passing the islands of Nosy Komba on the right and the marine reserve of Nosy Tanikely on the left. On arrival at Nosy Be harbour you will be met and transferred to the Vanila Hotel. Day at leisure to enjoy the island or maybe do some scuba diving. There is a scuba diving centre at the hotel to arrange your diving. Day trips to surrounding islands and activities can also be booked through hotel reception. There is much that can be enjoyed. From the beach to activities such as a quad bike tour, fishing, snorkeling and scuba diving, or just lazing along in a canoe. The choices are yours to enjoy. The hotel has an activity centre where various excursions can be arranged. Please bring light walking shoes, a Back-Pack is ideal to carry all your personal bits - a bottle of water, sunglasses, suntan lotion, mosquito repellent, Malaria Pills, hat, T-shirt for snorkelling, camera, local money for drinks and souvenirs. It is forbidden to purchase any coral and shells from the vendors! Please spray yourselves with insect repellent before entering any of the forests, for your own comfort. Ladies please carry some tissues in you pocket while travelling - you will find them very useful. No refreshments are served in the 4x4s nor on the boats - please carry water bottles - and if you have to buy something to eat on the road, buy sealed items such as biscuits, fruit, and sealed cool drinks such as coke - remember your stomach is not adapted to some of the indigenous food items sold out in the country side. - Snacks & Alcohol beverages.